Our initial focus was on the enzymes from E. coli. We cloned, sequenced and over-expressed the genes for the four enzymes. X-ray crystal structures of the enzymes were solved in a collaboration in the laboratory of Professor Tom Blundell at the Department of Biochemistry, University of Cambridge. The structure of E. coli KPHMT with product bound was solved to 1.8 Å resolution using a combination of native and selenomethionine proteins. This was a significant technical achievement as there were 160 selenium atoms in the unit cell. We carried out extensive structural and calorimetric studies on KPR. 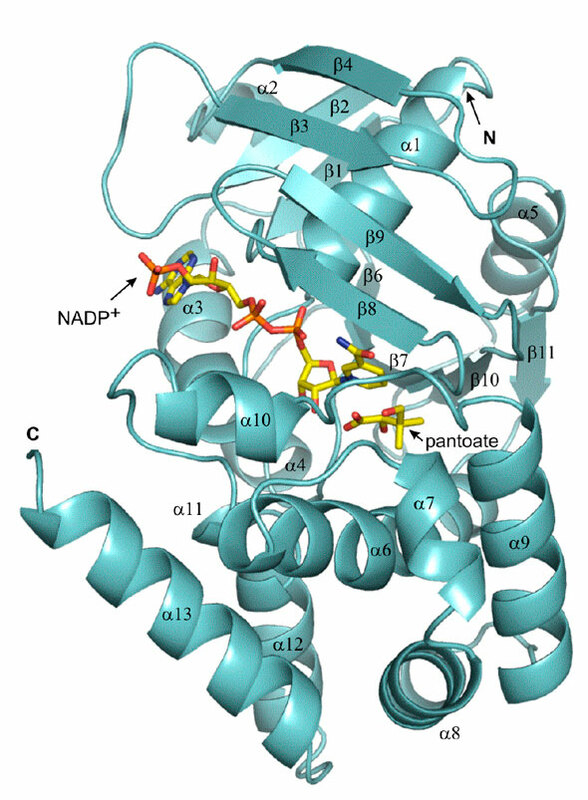 We have solved the structure of the apo-enzyme, the KPR:NADP+ binary complex and the KPR:NADP+:pantoate ternary complex, and used these to gain a structural understanding of the catalytic pathway. We solved the structure of the tetrameric protein and remarkably, the structure included a backbone ester, a key intermediate in protein processing. In order to study both processing and catalysis, we made a large number of mutants and characterised them kinetically and crystallographically. We have determined the stereochemistry of the decarboxylation and developed a rapid screen to look at the substrate specificity using MALDI TOF MS and developed a novel assay using isothermal titration calorimetry. Pantothenate synthetase catalyses the ATP-dependent condensation of pantoate and β-alanine. The reaction proceeds via a pantoyl adenylate intermediate. We solved the unliganded structure of E. coli pantothenate synthetase to 1.7 Å and synthesised a sulfonamide analogue of the pantoyl adenylate intermediate and showed it to be a potent inhibitor. Pantothenate pathway in plants: we used radiochemical feeding experiments to detect pathway intermediates in plants. We cloned two KPHMT genes from Arabidopsis and demonstrated that they are functional. We have verified the identity of a putative yeast panC gene by functional complementation, and isolated a cyanobacterial panC gene. In addition we have isolated cDNAs for pantothenate synthetase from several higher plants including Lotus japonicus and rice, wheat and Arabidopsis, providing definitive evidence for the pathway in plants. Escherichia coli L-aspartate-alpha-decarboxylase: preprotein processing and observation of reaction intermediates by electrospray mass spectrometry. Rapid screening by MALDI-TOF mass spectrometry to probe binding specificity at enzyme active sites. The crystal structure of E. coli pantothenate synthetase confirms it as a member of the cytidylyltransferase superfamily. Nanomechanical detection of antibiotic-mucopeptide binding in a model for superbug drug resistance. The final step of pantothenate biosynthesis in higher plants: cloning and characterization of pantothenate synthetase from Lotus japonicus and Oryza sativum (rice). Pantothenate biosynthesis in higher plants: advances and challenges.